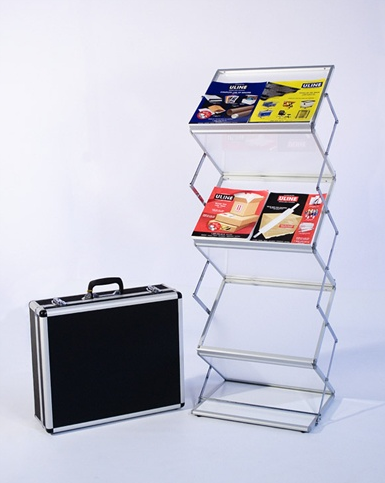 Our Double Double brochure stand holds 2 sets of brochures per shelf, with a forward and rear facing layout. This brochure holder includes free UPS ground shipping to a business address in the continental US. For air shipping options upon request. The height of this stand adjusts from 18" to 72" with a fixed width of 24". The stand accommodates one or two banners (for a 2-sided display). This is a special order item, all sales final. Most orders placed before 2 pm ship SAME DAY and are delivered to 80% of the US within 2 business days. Need something to fill your shelves? We offer great pricing on brochures, booklets and flyers.